On Saturday night, Void Omnia and Isenordal brought their summer tour to the Reno’s stage. When the tour was announced, I knew it would be a can’t miss show. The bands are currently touring in support of their latest split, which is available on cassette via Eternal Warfare Records and will be released on vinyl via Vendetta Records later this year. The Dallas stop of the tour was rounded off with local openers Wyrm Chasm and Giant of the Mountain. Wyrm Chasm @ Reno’s, Dallas, TX. Photo by Corey Smith. With an original start time of 9:00 pm, the show was pushed back about half an hour to 9:30 to let the Dallas crowd trickle in. Wyrm Chasm was first to take the stage. This is a true local band in the sense that bassist and vocalist Stephen Jeter not only played the show, but was bartending at the venue when not on stage. The band got the night started with tracks that were familiar to the Dallas crowd. Straight forward, melodic melodies exhibited by guitarist Eric Carrasco and Patrick Collins were backed by the meticulous drumming of Buddy Griffin. The band brings a welcomed relief of cavernous sound to the over-saturated brutal death and thrash that has become the staple of the local scene. The band blasted through the 30-minute set with ease. I hope the band ventures to have a more unique and energetic stage presence going forward that matches their beautifully composed musical style. Giant of the Mountain @ Reno’s, Dallas, TX. Photo by Corey Smith. Next on stage was Giant of the Mountain. The local two piece just returned from a successful west coast tour in support of their new album, Nature’s Wrath. I’ve said it before and I’ll say it again, Cody Daniels (guitars, vocals) and Randi Matejowsky (drums) are two of the most talented individuals that I know. This duo gets better with every show and every album released. The set opened with the track “Lamentations” followed by my personal favorite, “Changing Lands”. The crowd continued to grow as the band put on a clinic of musical compositions. From tremolo chords, to finger picked acoustic solos that I can’t even comprehend, Cody left the crowd in awe. The diversity of the tracks that the Giants performed left the crowd wanting more. This was a perfect set to usher in the touring acts. Isenordal @ Reno’s, Dallas, TX. Photo by Corey Smith. Next up was Isenordal, a name that wasn’t familiar to most of the crowd. For me, they are a band that I’ve been waiting to witness in a live setting for years. As the band began to load onto the stage, essentially straight from the van after a long drive and mechanical issues, the atmosphere in the venue drastically changed; a cleansing of sorts. The stage was clad with petrified honeycomb, animal bones, and moss, as the scent of burning sage filled the air. This was a perfect setting for a band that provides a mixture of dark folk, black metal, and funeral doom all intertwined in perfect harmony. The band consists of Kerry Hall (guitars, vocals), Jeff King (bass), Marisa Kaye Janke (viola, vocals), Brian Spenser (Drums), Lieu Wolfe (Piano, Keyboards, vocals), and G. G. (guitar). Isenordal’s performance was a perfectly composed roller coaster of extreme passion. The viola and keyboard played a vital role in balancing the heavy riffs and thunderous drums. Kerry Hall gazed toward the sky and delivered flawless, blackened-doom screams that were coupled with Lieu Wolfe and Marisa Kaye releasing howling vocals that were hauntingly beautiful. The vocals were layered perfectly in the mix for the style. The set was filled with songs ranging through their discography and also included the track from their most recent split with Void Omnia. This is one of the best live sets I’ve seen in a very long time. I would put Isenordal near the top of the Cascadian metal and folk movement. Words will never do a live show like that justice. Void Omnia @ Reno’s, Dallas, TX. Photo by Corey Smith. Having to follow Isendoral’s set was a monumental task, but the folks in Void Omnia were up for the challenge. The atmosphere shifted back to a straight-forward, in-your-face style of melodic metal when they took the stage. The short set flew by as the California natives kept the crowd engaged with their intense stage presence. 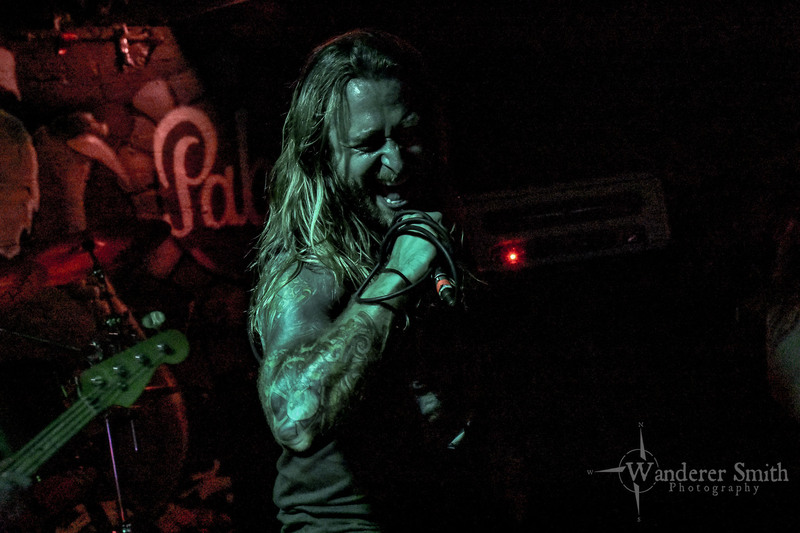 Jamison Kester commanded the stage with a vocal performance consisting of well-balanced screams that fit right in with the aggressive riffs and blasting drums. Void Omnia delivered a highly professional set, clearly masters of their craft. Tyler Schroeder (guitars), Mike Jochimsen (guitars), Cody Stein (drums) and Justin Ennis (bass), worked together as a cohesive unit to deliver a destructive performance with upbeat tempos that had the crowd breaking their necks and raising their fists to the sky. What seemed like a 20-minute set was all you needed to get the full effect of what Void Omnia is all about. This is a perfect tour package that mixes melodic black metal with atmospheric soundscapes. If you have a chance to catch this tour, it will be an experience that you will not soon forget. Very good article! We wll be linking tto this great post oon our site.